Do you know why I love quilting? Because of this quilt lying on my bed. 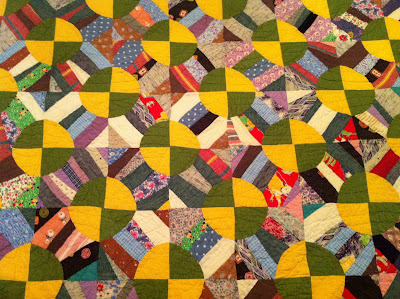 A quilt made by Mr. Right’s great-grandmother and great-great-grandmother out of the scraps of his grandmother’s childhood clothes, and those of her seven brothers and sisters. It’s such a piece of history. 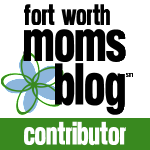 What other heirlooms tell that kind of story while looking fantastic in your house? It was a small added bonus that this quilt happens to look like something you’d pick up today from Anthropologie, and it brings a pop of color to our otherwise neutral bedroom. 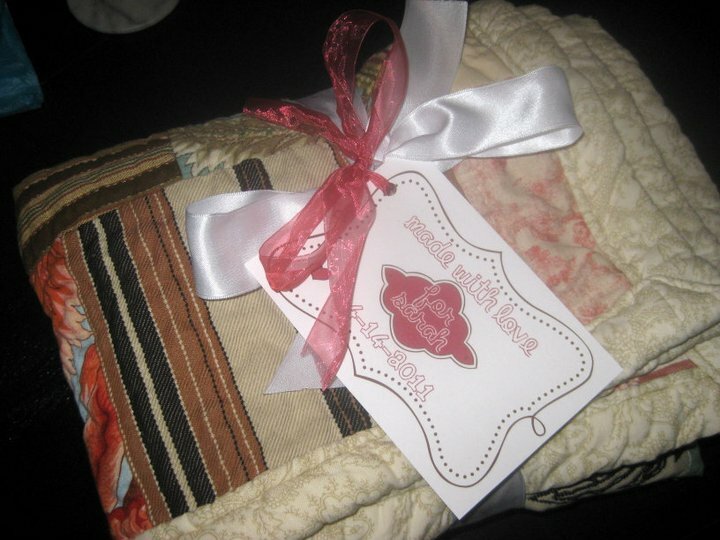 That’s what I think about as I make my own quilts to give away as gifts. My sister has one of the few I’ve finished. Okay, I admit… I’ve only finished two. But I’ve started three more. 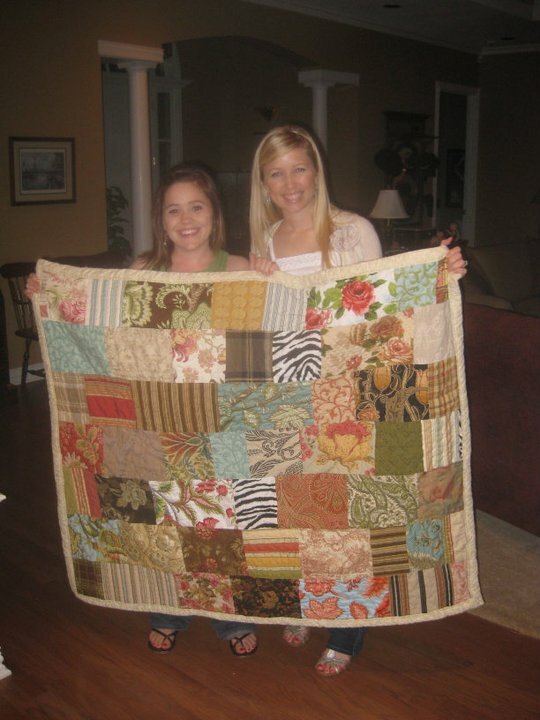 Just for kicks, here’s the first quilt I ever made… finished in September 2008. If you ever think about dipping your toe into quilting… a strip quilt is a great first project because they’re super fast and super easy. 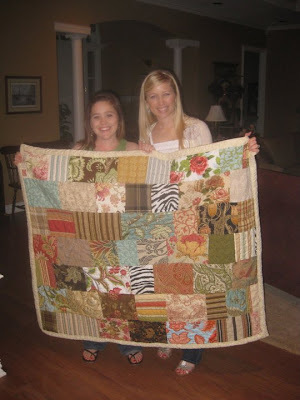 Tonight I hope to finish my next prized quilt, which I started in the fall of 2008 and took me over a month to piece together. It was a bit aggressive for only my second quilt ever (I started this one before I made Sarah her Ethan Allen scrap quilt), and it was my first exposure to the meticulous measurement (and math!) that quilting requires. For the record, my math is atrocious, but it was worth it. Originally I started quilting this by hand, and then lost interest about half-way through. (Who me? A.D.D.? Never.) Then a few weeks ago at our family reunion, one of Mr. Right’s relatives, who teaches quilting classes (score!) 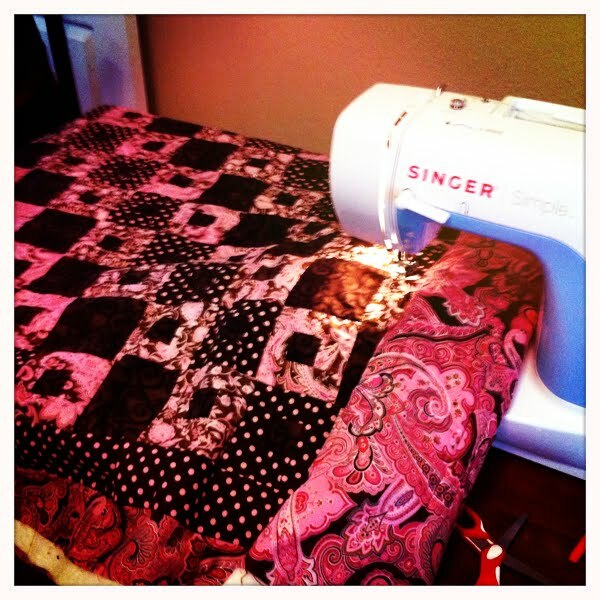 gave me tips on how to quilt on my teeny-tiny sewing machine. I didn’t think it was possible to quilt on this $200 Singer I picked up on a whim at Target back in the summer of 2008… but alas, it’s totally doable! In case you’re wondering, the secret is to roll the edge of your quilt up, which helps it to fit between the machine and the needle. I had tried just bunching it before, which takes up more space. It took me several hours to rip out all of my old hand-stitching and then about four hours to quilt everything on my machine, which I did while listening to a book on tape and sipping ice tea. Those four hours of sewing would have taken me about six months by hand, and I’m absolutely giddy about the results. 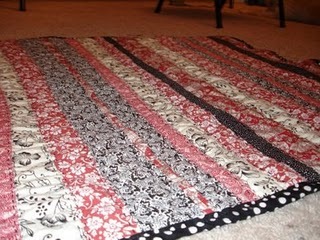 My stitches may be a bit crooked in places, but I think it adds to the home-made quality of the quilt. If you want perfection, go to a department store. 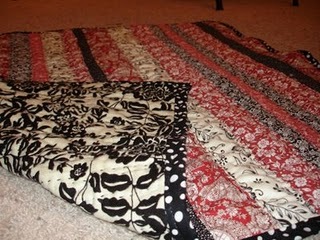 If you want personality and a few flaws and lot’s of love built into your quilt, then you can have one of mine. Tonight I’ve got to bind it. I’m trying a different technique this time, which I’m a little nervous about, but I’m determined to conquer it. Once I do, I’m going to celebrate by purchasing fabric for my next project… it’s taking every ounce of will power I have not to go before I finish this one. And not to worry, the yo-yo’s continue… I’m about 150-200 yo-yo’s in, with about 800 more to go. I mostly work on that in the car, at the hair salon, or while watching movies with Mr. Right.